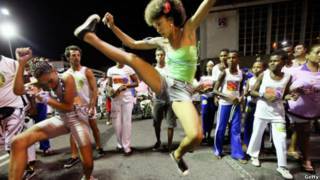 Image caption Brazilians performing capoeira in Salvador on the first day of the country's carnival celebrations. Capoeira is a Brazilian martial art form which combines elements of dance, music, acrobatics and fighting. It often forms a part of the Carnival of Brazil, an annual festival held forty six days before Easter. The lively celebrations attract millions of visitors each year. I'm not frightened of abseiling - I actually get a real kick out of it! She got such a kick from the dance class that she's thinking of taking it up full time. He didn't think he would like Barcelona, but he got a real kick out of the place. 如果想戒掉什麼壞習慣那麼就可以說 to kick a habit. I'm giving up smoking, it's time to kick the habit. Biting your fingernails is disgusting! You should really kick the habit!